After bottoming out with the worst record in the league and franchise history in 2018, the Orioles are fully invested in a total rebuild behind a new GM and field manager. BALTIMORE — It’s 9:30 a.m. on a typical mid-Atlantic, January morning — the temperature having not yet clawed its way above freezing, the wind chill somewhere below that, as hundreds of orange- and-black-clad hopefuls and die-hards stand, shiver and stomp their feet outside the Convention Center at Baltimore Orioles FanFest Saturday, waiting for hope. One such fan is an adolescent boy, no older than 14, wearing a flop of blond hair, a hoodie … and shorts. Yes, shorts. He’s of that age, old enough that the allegiances that bond us to cities and laundry in ways that are hard to explain to loved ones have already set into their lifelong, concrete mold. It’s that kind of blind optimism — shorts in winter, that is — that might be required of Orioles fans these days. But at least the sun is out and the skies are blue, which might be enough to help you remember that it will, eventually, be warm enough to play baseball again, a fact that itself is at least worth looking forward to, even if it’s hard to find much else heading into the 2019 season. The Orioles weren’t bad in 2018. They were historically, achingly bad. They lost 115 games, more than any team in the 118 years of the franchise’s existence. They finished 61 games out of first place, further back than the 1962 Mets, more games behind than any Major League team since 1942. At the end of the season, they fired their longtime manager and general manager. They are lying on the cold, cellar floor of the sport, with everything above and nothing but four feet of solid concrete below. But the view can only improve. That was the sentiment at FanFest. As Bridgett Graves, a lifelong fan who grew up walking distance from Oriole Park in Pigtown, waited for new GM Mike Elias and new manager Brandon Hyde to speak, she exuded optimism. She was even idealistic that the team would be competitive. Elias, a 36 year-old Yale graduate originally from Alexandria, was far more measured in his expectations for the club in his first year. “I want to see the overall talent level up and down this organization go up,” he told the expectant fans. As for making moves to win this season, Elias said he’d eschew any transaction that he deemed “not strategically relevant” to that long-term goal. Later, with the media, he continued to talk in positive, boardroom generalities. That’s not exactly Davey Johnson’s infamous 2013 “World Series or bust” aspiration or bombast. But it’s what one should expect from someone of Elias’s pedigree, especially given the situation he’s walked into. Neither his nor Hyde’s hire feel accidental. Elias helped the Astros through their teardown and rebuild that culminated in the 2017 World Series title. Hyde was a part of Joe Maddon’s staff that helped engineer their revival and a 2016 World Championship. Part of hiring people with those histories is selling the hope that, just maybe, the same thing can happen here. But Elias was careful to caution against even that. “Brandon went through this with the Cubs, and I went through this with the Astros. And both of those rebuilding processes went incredibly fast. I can’t say that that’s always going to be the case with these things,” he said. It’s true that the conditions aren’t nearly the same for the Orioles, or MLB at large, as they were five years ago. So many teams have elected not to seriously compete, to largely or entirely sit out free agency, maximizing their revenues instead of their wins. That means more fish swimming the same way through rebuilding (or “rebuilding,” for those that continue to tear down before they ever really get competitive) and less willing to pay out in prospects or take on the salary of aging veterans. It can mean a tougher market to thrive in. “I’m hopeful that we can do it, I know what we need to do in order to get there, but there’s going to be a lot of things happening here, depending on who we draft, how they do, how well they progress, how well the players here progress, who’s in the minor league system right now,” said Elias, making mention of Jose Altuve, Dallas Keuchel and George Springer, all of whom were already in the system when Houston began its rebuild. 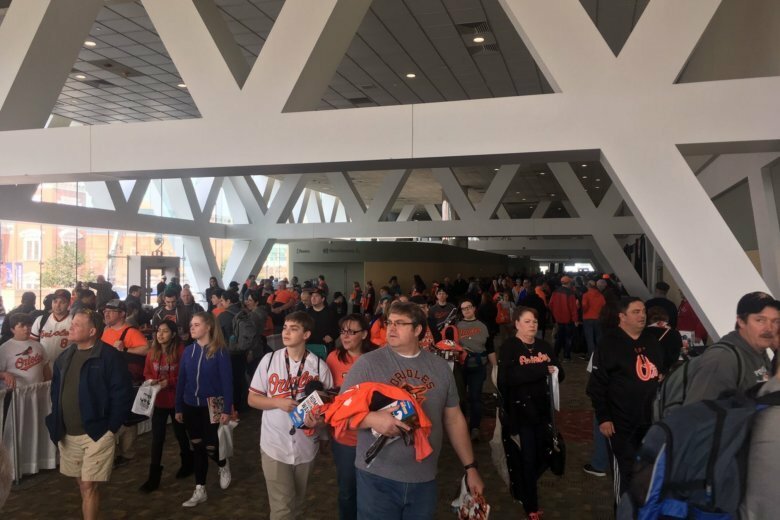 The club did an admirable job of scaling the event to use just the right amount of the Convention Center that it always seemed busy without being overly crowded. Giveaways were plentiful, attendees carrying armloads of new gear. But the attendance figure tells the story. After drawing north of 15,000 fans in four of five years between 2013-17, that number dropped to 11,000 in 2018. On Saturday, just 8,000 fans attended. Elias was unabashedly impressed with the fans that did attend, though. Father and son Jim and Daniel Hott and Daniel’s cousin Justin Schellhaus of Cumberland, Maryland were some of those fans. As a lifelong fan, Schellhaus wasn’t surprised by the enthusiasm, despite the ebb of the team’s competitive arc. The elder Hott was specifically excited about Elias and his track record. Both Elias and Hyde stressed the kind of player they were looking for in their remarks to fans. Fielding a question about certain unnamed veterans perceived not to have hustled, Hyde wasn’t shy to vocalize his opinion. Elias, meanwhile, talked about finding prospects with “good character” or “makeup,” saying that the ability to continue to grow and take direction was crucial to surviving the minor, and eventually major, leagues. “We try to look for guys that are built for that,” he said. And maybe there’s something to that for this team right now. Nobody’s selling wins, but maybe selling hustle and heart works for the kind of fans who would stand out in freezing weather for the chance to hear the front office speak more than the players on the team itself. Maybe hope is powerful enough to overcome the winter cold. After all, spring is just around the corner.